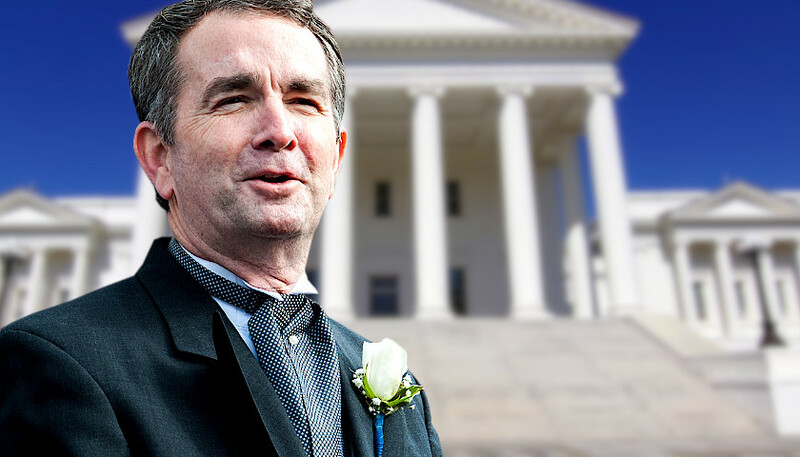 There is no question that Virginia Democratic Governor Ralph Northam’s abortion comments warrant—demand, actually—political excommunication. They were completely unpardonable. Devilish in their blithe disregard for human life, Northam’s comments encapsulate the clinical utilitarianism by which liberalism invariably reduces inconvenient people to a disposable commodity, like an old car or television. That the mainstream media did not burn Northam in effigy for his endorsement of infanticide (no, that term is not hyperbole) should be a clear sign of where they stand. Judgments should be made accordingly. At the same time, no one should mistake the many and recent calls for Northam’s political head for a rare display of sanity on the part of Democrats. The cold, hard, reality remains that were it not for the emergence of the racially charged medical school yearbook photo of Northam, Democrats either would have kept mum or would have defended Northam’s insidious comments on abortion. The political calculus they performed in the hours after the yearbook photo was revealed resulted in them deeming Northam a liability to their brand. The final straw was Northam’s fatal performance in last Saturday’s press conference, where the disgraced Virginia governor made a fool of himself, and by extension, his party. The result? The media establishment performed an act of Orwellian doublethink; CNN (mis)labeled Northam a Republican on its press conference chyron. Northam was no longer a useful idiot. He was just an idiot. Someone, who in utilitarian terms, had served his purpose and as he made clear he supposed of some human infants, he was now inconvenient and expendable. That was, until the other scandals emerged. Now the calculus is more complicated. If liberals cannot now recognize the obvious creep of this kind of intellectual tyranny, they eventually will—and with potentially deadly consequences. One can easily imagine a not-too-distant future in which the Party becomes even more “progressively woke” than today and retroactively indicts all those who have not caught up. Even the most loyal of adherents may soon find themselves in the crosshairs. If, by happenstance, some unhappy reminder of one’s past views regrettably were to materialize, where would the unlucky reprobate go to find succor? He will be forced to come to terms with his obsolete views from a decades-old tweet, for instance. Perhaps in the best-case scenario he can be “reeducated” and pledge his adherence to the new morality, spared (if only temporarily) from the inexorable damnation that awaits him. But it should be clear that an individual, facing an insatiable collective, can never “catch-up.” He stands powerless in their midst; with only the futile hope that come time for his periodic evaluation, the Party that day is overcome by a fit of magnanimity, delaying his perdition until tomorrow. That summarizes, with only the slightest of overstatements, the series of events awaiting Ralph Northam. Northam was much too much a dunderhead to realize that by surrendering himself to the party of “woke,” though briefly awarded with power and influence by dint of his office, he would be forced to adhere sharply to their code of conduct. That Northam did, and did well during his short time as governor. But what he failed to comprehend was the voracious character of the covenant he endorsed—one not shy about devouring its own at the tiniest hint of thoughtcrime, even retroactively. This brings us to reaction by many so-called conservatives who, as they think shrewdly, have appropriated liberalism’s imperative to bring down Northam and joined the cries denouncing him for the photo. The end goal is indeed worthy. To reiterate, Ralph Northam should resign. But his crime is of more recent vintage than the yearbook photo. His crime is what he said as governor about infanticide—er, abortion. In this case, however, the end absolutely does not justify the means. If Northam does eventually step down, the narrative will be that he committed sacrilege in the eyes of the woke morality of liberalism, not that he spoke grotesquely of aborting unborn children. Recall that liberalism effectively is a secular theology—replete with rituals, relics, and holy days—but plainly without the redemptive sacrament Christianity offers. As a result, as it continues its pattern of eating its own, it will sterilize the rest of society’s aberrant thoughts to clear the way for mindless conformity. Failing to recognize this danger will make conservatives complicit bystanders in the destruction of free society. Conservatives must heed this warning: political victories are certainly welcome, but sacrificing the larger point for the sake of an immediate political victory, is not really victory. It’s capitulation to a tyrannical opposition. Just a few months ago, conservatives fiercely and rightly stormed to the frontlines to defend one of their own, Brett Kavanaugh, from the leveling hand of liberal wokeness. In their victory, they achieved not just the immediate end of securing a seat on the high court, but more importantly, a moral victory in rebuking, if only temporarily, liberalism’s most wolfing impulses. Though I do not believe there is any moral equivalency between Kavanaugh and Northam’s cases, the latter’s detestable abortion comments are plainly on record for all to see. In Kavanaugh’s case we were defending one of the most foundational principles of our republic—the presumption of innocence, without which we cannot be free. In a side-by-side comparison of the facts, the differences are patent and obvious. But let’s disregard Northam’s abortion comments for a moment. If this medical yearbook photo had come to the fore in isolation of any hot button political issue, would it still have had the same effect? Maybe, but it becomes less clear cut for conservatives who purport to value fairness, forgiveness, and the principle of innocent until proven guilty over emotive decisions, even for short-term wins. Sure, one could make the case that there’s clear evidence of Northam’s malfeasance—the picture conveniently located next to his yearbook photo is undoubtedly racially charged and certainly licenses public rebuke. The hypocrisy alone is astounding. But is it so profligate as to force his resignation? According to Northam, it was not him. Although that might be a harder sell than Christine Blasey Ford’s zero-evidence (though theatrical) performance—we still cannot be definitively sure it’s him. But even in the event absolute proof emerges that it’s Northam, should that require his political resignation well over three decades after the fact? If Northam had a well-documented track record of racism and bigotry over most of his life, that would certainly justify a more wholesale indictment of his fitness to continue serving as Virginia’s governor. At the same time, however, all citizens should be accorded some allowance for a few thoughtcrimes, especially for those committed decades prior and with ample public documentation of repentance in the meantime. As much as we like to think of ourselves as having conquered nature, humans remain imperfect, sinful animals. We must be allowed to make mistakes without having to sacrifice an entire career—even if the rest of our term in whatever office we occupy is met with extra scrutiny as a result of past blunders. Finally, let’s also keep in mind that despite our contemporary political fetish for “progress”—Republicans and Democrats are similarly Hegelian in their adherence to the dogma that today is better than yesterday, and tomorrow will be even better than today—such oversimplification of history can be harmful. As Northam’s mishaps over the past week demonstrated, mainstream Democrats and their media allies will selectively incorporate morality to suit politically expedient ends. Both racism and abortion (infanticide) are prima facie immoral. However, our culture’s condemnation of the former, while good, should not overshadow the moral seriousness of the latter, which, given that its outcome results in the irredeemable termination of human life, should be treated, at least in conservative circles, as an unparalleled moral evil. Liberals essentially are relativistic in their morality—their ends are ambiguously defined, resulting in a fleeting arbitrariness that could consign something in today’s generation good that was in yesterday’s bad. If conservatives call for Ralph Northam’s resignation, as they should, they must do so with cautious awareness that it was for his public comments on abortion-infanticide, something that is morally irredeemable, rather than a very stupid choice made some three decades ago that our mostly groundless zeitgeist thinks now a sacrilege of irredeemable offense. Paul Ingrassia is a co-host of the Right on Point podcast. To listen to his podcast, click here. You can follow Paul on Twitter @PaulIngrassia. Photo “Ralph Northam” by Craig. CC BY 2.0. Background Photo “Virginia Capitol” by Skip Plitt – C’ville Photography. CC BY-SA 3.0. Governor Northam is 1/1024th human being.